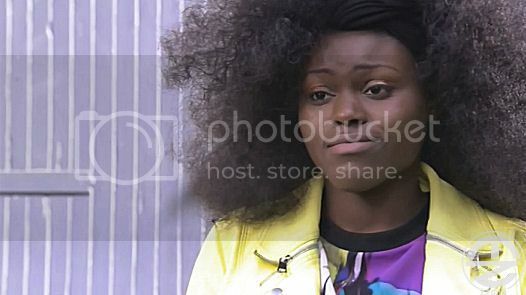 Blessing Chambers Hollyoaks Transgender Storyline Blog. 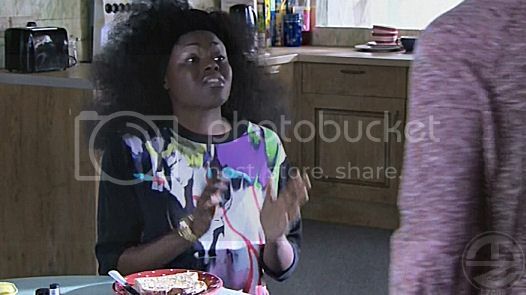 - Transgender Forum Transgender Forum • Blessing Chambers Hollyoaks Transgender Storyline Blog. Welcome to the Support and Advice section for Hollyoaks and Channel 4. You may have found this page because you clicked from Channel 4 and are in need of help and advice. Our site and its team can provide it. We have been helping people since 98. Many broadcasters and Universities trust us to offer the help people need. You may only need to read our take on UK media for fun or are looking for medical and or social support. There are many ways you can get further involved in online support. From just saying Hi to all the way up to helping others. For Channel 4 Help and Support for Transgender Issues from their advice pages you can visit our Agony Section here viewforum.php?f=10 Guest area available for those who do not wish to register! for other stories inc FTM Transgender Men. 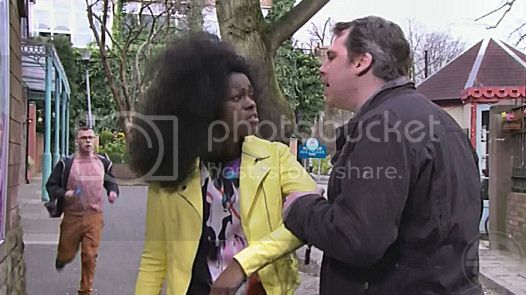 Re: Blessing Chambers Hollyoaks Transgender. OK So the Blessing Trans Storyline is about to begin. 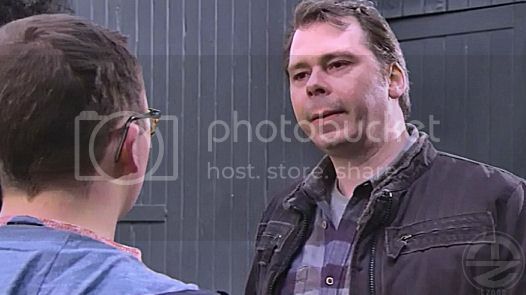 (As an aside I have just been informed (by Julia Grant that some of her trans friends are auditioning for the Soap) that the writers are now going to review the storyline and get some actual transgender people in the programme - watch this space. And keep the pressure on for transpeople in drama!). 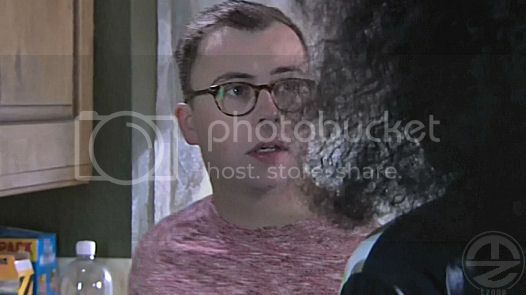 BEGINNINGS - from here on in I will do my best to have summaries of the HollyOaks Storyline. 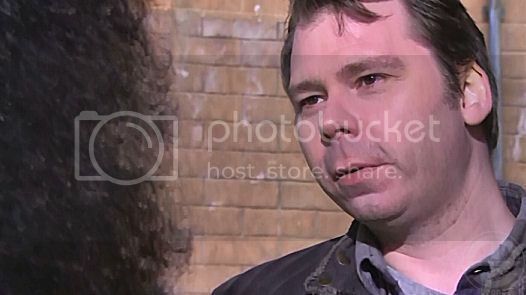 It is unlikely to be as in-depth as Jason Costello (Victoria Atkin of 3 years ago here - viewtopic.php?f=48&t=434) as I now host and edit a weekly TV show But this is important so needs to be archived. As we could be well on the verge of something else beyond this cisgender actress. Time will tell. It began with her having her handbag raided by a flatmate and they took her cashcard to the ATM when they got back they said they took the money she owed from her card. And she snatches off them. "You have no idea what you have done!" She is then seen sitting on the stairs upset holding the card. 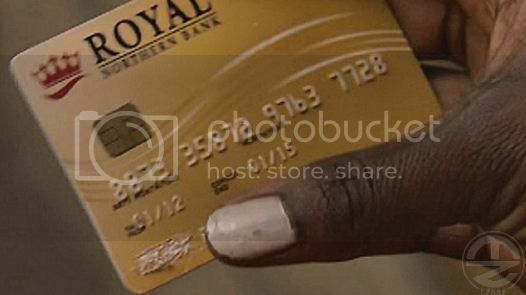 In the close-up we see her 'old name' scratched out on the card. Will this show up in a statement? Who knows? This is clearly the leader into the story to come. It all starts here. A private investigator turns up but he is not all what he seems. 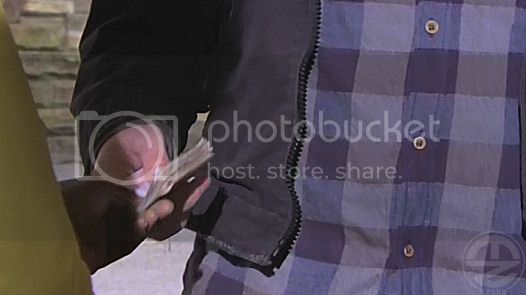 He questions the couple who drew money from Blessing's card at the ATM. And is looking for her. He then follows her flatmate home where Blessing panics and says, "You didn't tell him where I live did you?!" The Private eye waits until the lad leaves and walks in on her. Blessing - "What do you want?" PI - "£500 by tomorrow!" Blessing - "I can't! I don't have that kind of money!" PI - "Well if you don't want people to find out where you got that credit card I strongly suggest you do find it!" From Michael (PI/Blackmailer) - "Got the Cash?!!!" She is behind in her rent and managed to get her flatmate (Dennis Savage) to carry her debt for a while longer. 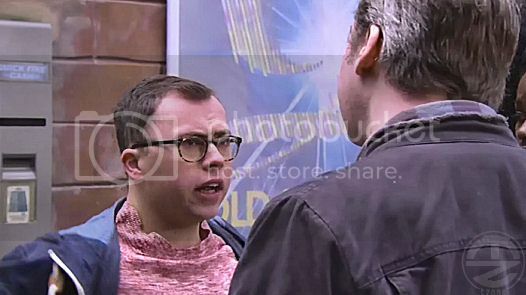 [Tzone TV Archives Trivia - Dennis Savage who is played by Joe Tracini also starred in 'Coming of Age' 'BBC' Which was in turn transphobic in places - so that's interesting]. Later he pops in to see her and notices she has £500 in her hand for the blackmailer. Dennis - "Oh I see you got that a bit fast! Did you rob a bank or something?" He notices her face drop and says worryingly, "That's not my rent money is it?" Blessing - "I owe it to someone else." Dennis - "But you said you didn't have any money." "Why would you say that?!" Blessing - nonchalantly, "it is just some stuff I've been saving. Doing cash-in-hand"
Dennis - angrily, "Oh right! While you've been living rent free sponging of a prize mug?!" Blessing - "It is not like that Dennis!" Dennis - "Look I am all for helping a mate! But mates don't lie!" "OK I am not going to be taken for an idiot!" 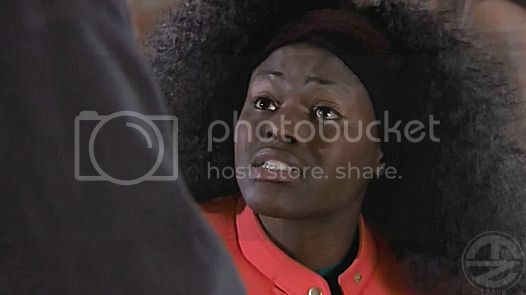 Blessing - "I wouldn't do that, not to you!" Dennis - looking at the money, "but you are not going to pay me my rent." Just then (as she was about to hand the money over to Dennis) she notices the blackmailer outside looking at her with his arms folded. Dennis - "Then you can go home and pack your bags!" "I need you out of the house by the morning!" Blessing is handing over the cash. Blessing - "It is only a couple of hundred but I will get you the rest!" Blackmailer/PI - angrily - "Tomorrow!" Blessing - "Give me a chance!" (Desperate) "But this is everything I had!!!" The blackmailer smiles (creepily) and says - "OK! Have it your way!" And is about to walk! Blessing grabs his arm - "NO!" (Whispering eyes darting and looking about sheepishly fearing she maybe overheard) "You cannot say anything!" "Promise me?!" Blackmailer/PI - "If I get what I want by tomorrow afternoon our little secret stays that way, OK!" "If I don't?! Well... Good luck with that!" He takes what money she has and leaves smiling. So it is the day that Blessing is supposed to be evicted from the flat. Dennis - "I obviously didn't make myself clear yesterday!" Blessing - "Please let me explain properly!" Denis - (ANGRILY) "You really see me as an easy target don't yah!" Blessing - "Look a while ago I found a wallet in the street and I used the bank cards!" Dennis - "Oh, fraud as well now?! BRILLIANT!" what I did but I was SO desperate. Blessing continues... "But there is this private investigator, and he is blackmailing me but if I don't pay him, he said he's go to the police!" Denis regains his composure - "I can't trust a word you say anymore." "You gotta go!" PI - "I don't think your will find Con artists wanted on there!" Blessed - "What do you want?" PI - "Is there something wrong with your memory?!" Blessed - "I need more time!" (AND ATTEMPTS TO LEAVE). (THE PI GRABS HER ARM ROUGHLY IN THE DISTANCE DENNIS WITNESSES HER STRUGGLING TO PULL AWAY AND RUNS UP TO THEM). PI - "I am not renowned for my patience!" Dennis (with a squeegee in his hand) - "OI! What is going on here!!!" PI - "We are 'aving a chat!" "What's it gotta do wiv you?!" Dennis - "I think you should go mate!" PI - "Or whot?!" (LOOKING DOWN LAUGHING AT HIM HOLDING THE WINDOW SQUEEGEE) "You'll 'wash me'?" 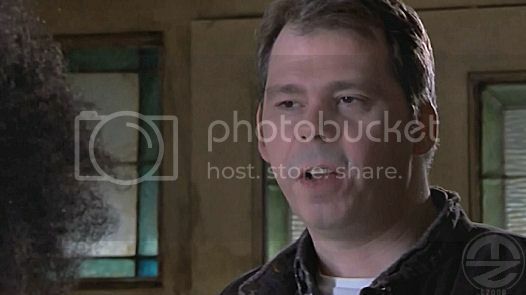 Dennis - "Never under estimate a man with a squeegee!" PI - (LAUGHING) "I will see you soon Blessed!" Blessed - "I didn't know you were so brave!" 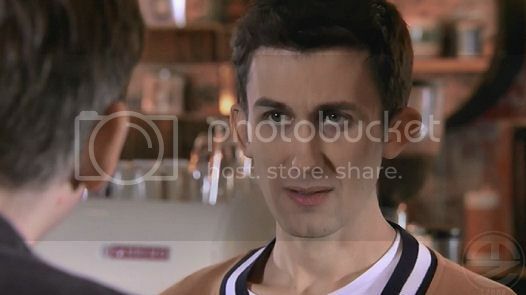 Dennis - "Is that the man blackmailing you?!" Blessed - "Forget it! It is my problem." 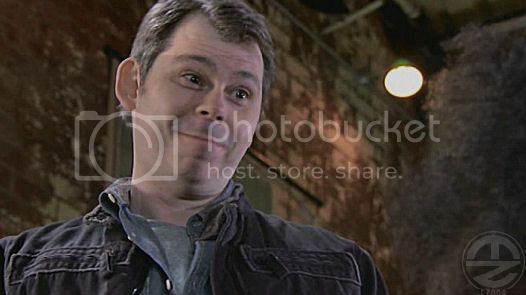 Dennis - "I am going to give you the money to pay him!" Blessed - "Oh you are amazing!" Dennis (SMILING ALL BASHFUL) "I'd better go to the cashpoint then!" Blessed - "Thank you Dennis." Dennis (the hero walks off with a swagger), "S'all right!" He then walks the wrong way and walks back - "It's there isn't it..."
Blessing smiles and shakes her head...(HER HERO). She arranges to meet the PI to pay him the remainder of his demand. PI - "Oh that was quick? 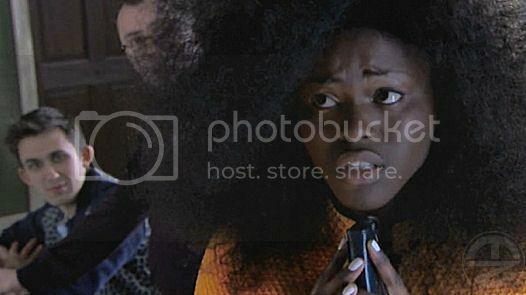 Don't tell me Captain squeegee to the rescue?!" "I wonder what you knight in shining armour would think if he knew what you did?!" Blessing - "No please you can't tell him!" PI - "Don't worry! You secret is safe with me." "For the moment!" HE WALKS TO LEAVE - "Take care Blessed!" Love the Joey Tribbiani (Matt Leblanc) from the Sitcom Friends 'Smell the Fart Acting' http://www.youtube.com/watch?v=7Qxkj9JWOWQ http://www.youtube.com/watch?v=H0FoAilP1K0 He has ruined soaps for me now as there is a bit too much smell the fart with Blessing - I think she needs to rein that in a bit Dennis is a dork but a more natural and likeable dork. Blessing is a tad too intense in places and over dramatic in her body language. The truth is she would likely freeze up and try to make herself smaller and feel vulnerable in this situation. Even furtive as to not be spotted by her aggressor. But hey these plots have to be orchestrated to work in a certain way. This is probably a weakness in this instance as I think the 'surprised look' for everything is a tad one-dimensional - even tiring. Probably great on stage though, just too intense for a close-up wide angle in HD.